We’d love your help. Let us know what’s wrong with this preview of Parents Rising by Arlene Pellicane. To ask other readers questions about Parents Rising, please sign up. This book was so good and so fast and easy to read. Most of the time it takes me longer to read nonfiction than fiction, but I blew through this book in two sittings and barely wanted to put it down. Miss Arlene uses a combination of examples from her own life, situations she's seen, Bible verses, and statistics to write a compelling book that gives parents eight strategies for raising kids who love God. As a non-parent, I always find it intriguing to see the thought process as to why parents do what they do. The psychological side of parenting is something that I've always found interesting and Miss Arlene does a really good job of explaining things in a very easy to understand way. Her strategies are very practical and have solid reasoning behind them and statistics to back up what she has to say. The chapter titles include "Amusement Is Not the Highest Priority", "Launching Adults, Not Babying Children", and "Good Food Served on the Table." Each chapter was encouraging, entertaining, thought-provoking, and included ideas about how to incorporate the strategy into everyday life. This is one of my favorite parenting books I've read yet, and one that I hope to re-read after I have children. It's short and therefore not overwhelming to pick up, plus it's so full of good information. 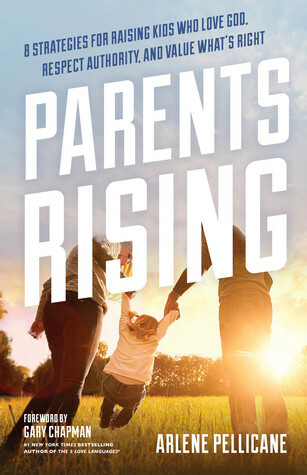 Parents Rising is the latest book by author and mom of three Arlene Pellicane. Since my daughter is only two I have just begun reading parenting books and so far, Parents Rising is one of my favorites. The book title is derived from the challenge Arlene presents to parents throughout the book which is, "Parents we must rise." Parents must rise against the low expectations set by culture regarding how children behave and whom they become. I enjoyed this book so much that I could hardly put it down Parents Rising is the latest book by author and mom of three Arlene Pellicane. Since my daughter is only two I have just begun reading parenting books and so far, Parents Rising is one of my favorites. The book title is derived from the challenge Arlene presents to parents throughout the book which is, "Parents we must rise." Parents must rise against the low expectations set by culture regarding how children behave and whom they become. I enjoyed this book so much that I could hardly put it down. In fact, I finished the book in 3 days. Rather than being divided into chapters, Parents Rising is divided into 8 strategies parents are encouraged to begin practicing. As a follower of Christ, I was excited about Arlene writing from a Biblical perspective. One of the opening statements she begins with is, "The number of parents who raise kids who love God, respect authority, and value what's right must increase for the sake of your children, and the generations that follow. There's too much at stake in eternity to get sidetracked on a smartphone," (pg. 19) - she is absolutely right! In this day and age with so much opportunity for distraction, I really appreciated this much-needed reminder. I am also thankful that Arlene encourages parents to teach their children self-control and uses Proverbs 25:28 as the basis to do so. I've heard many other Godly parents encourage this as well so it was helpful that Arlene mentioned it and gave some examples of how teaching our children self-control will pay off in the long run. Arlene is also faithful to emphasize the importance of parents training their children to honor and obey their parents in alignment with Exodus 20:12 and Ephesians 6:1-3. One practical tool included in Parents Rising is the ABC Test on page 74. This test encourages parents to train their children to think through the following when it comes to media (tv/movies/music/video game) choices: Attitude (What attitudes does the media encourage? ), Behavior (What type of behavior will it encourage in your child?) and Character (What kind of character traits are devalued and praised?). I really like this simple test and plan to implement with my children. On page 61 there is a reference from a psychologist who encourages parents to help their children cultivate flexible thoughts. An example provided is, "Let's say it's bedtime for your son but he's not really tired. He can either think, 'I'm going to flex with it,' or 'I'm going to fight against it and throw a fit.' Those are two basic options. Will he think flexible thoughts, or will he think mad thoughts?" I was confused by the inclusion of this idea in the book because it seems to imply that we ought to train outward behavior. While this is, indeed, a part of the parenting equation, it fails to emphasize the need for parents to help their children address what is going on at the heart level. I'd rather have a conversation with my children that involves me seeking to understand (Proverbs 20:5) and asks questions that help them see their need for a Savior. I would also encourage teaching children to memorize Philippians 4:8 and use that as a filter for their thoughts. Flexible thoughts can change outward behavior but may not necessarily direct the child's heart back to the living and active word of God (Hebrews 4:12). Mad thoughts are synonymous with angry thoughts and unrighteous anger is both foolish and sinful - it must be addressed and repented of (Proverbs 29:11, Ecclesiastes 7:9, James 1:19). My second caution involves the reference on page 89 from the book Love and Respect. The one quote used in Parents Rising isn't wrong or sinful but I highly encourage readers to exercise wisdom and caution should they choose to read Love and Respect. I'm not sure why this book has gained so much traction in Christian circles because in listening to others rave about it, I've realized that it presents love in the marriage relationship as very conditional which is a stark contrast to how marriage is depicted in the Bible (see Ephesians 5:25-33). I haven't read Love and Respect but what I know of it from others and this review (http://www.hopeforlifeonline.com/wp-c...) is enough to keep me away. These concerns aside, I really enjoyed Parents Rising and encourage you to pick up a copy so you too can enjoy learning from Arlene's wise words. The book lays out eight strategies for parenting. Some of these strategies include “A This is a Christian book on parenting. The author is Arlene Pellicane who is a public speaker on Christian parenting and she is a frequent guest on various radio show interviews such as Fox & Friends, Focus on the Family, and The 700 Club. I admit I’m frequently on guard with “pop Christian” self-help sort of books and resources and my guard was up reading this book. Nevertheless I did find this book useful. The book lays out eight strategies for parenting. Some of these strategies include “Amusement is Not the Highest Priorities,” “The Bible and Prayer Everyday” and “Launching Adults, Not Babying Children.” The end of the book also include a Parenting Manifesto and questions for discussion groups. I felt the biggest take away from this book is the call for parents to be in charge and to not let the children run the family and the parents. I felt at first it was rather redundant and a given for me personally but thinking about it further I realize I can’t fault the author here since this is a real problem among parents today both Christian and non-Christian parents. While the author talked about parents being in charge the book also balances this point by talking about how controlling does not always equal being caring especially when it becomes babying of the children in a way that enables problems or undermine responsibilities. The book does a good job laying out parents responsibilities that is consistent with a Christian worldview. For instance the author talks about the need of parents to model godly marriages to their children. I loved how Arlene talked about holiness is measure not by how much Bible one hold but how much the Bible has a hold on our lives. Witty. I cheered when the book talked about discipleship being a primary responsibility of parents and not pastors and teachers. I also appreciated the statistics provided in this work. For instance in the discussion about parents putting away their device in order to properly parent I was blown away that a study found fifty six percent of children surveyed felt they want to confiscate their parents’ cell phone; normally we think of parents having the need to confiscate their children’s electronic devices but the reverse for parents is sadly also true! This was convicting and made me think more intentionally of putting phones away to give my children the time and attention they need. I also found the book stating that the highest probability of promiscuity of young girls is when they start dressing and appearing older than they really are. That hit me hard and I hope to remember this when my daughters grow up. I appreciated the author talked about how what happen if the parents have already messed up and allowed their daughters to dress rather immodestly and how parents should confess to their kids their sins and mistakes first before going shopping for new and appropriate clothes. I also enjoyed the book mentioning that parents shouldn’t depend on their child for their emotional support; this was mentioned several time in the book both in the first half and towards the end. I know growing up as a kid my mom was this way towards myself and my siblings so this stood out to me and I agree with her. In a world where parenting can sometimes seem like a losing battle, this book provides 8 essential strategies for leading kids through the murk and mire of our ever-changing culture. So many parents ask questions about navigating the parenting journey in today's society as well as how to raise happy, obedient kids without turning them into colorless automatons. This book can be just the resource you've been looking for. Whether you're parenting toddlers or teenagers, are single or married and cont In a world where parenting can sometimes seem like a losing battle, this book provides 8 essential strategies for leading kids through the murk and mire of our ever-changing culture. Whether you're parenting toddlers or teenagers, are single or married and contemplating kids one day, or even just work with kids and are bothered by all of the child-is-the-center-of-the-world behavior you encounter so often, this book will provide you with simple, practical strategies to help set proper boundaries while still allowing the unique personalities to fully blossom. *Each strategy has its own chapter and at 164 pages, this book is a quick, easy read that won't take up too much time -- a feature that probably every parent will appreciate! In addition to the discussion group questions presented at the end of the book, each chapter concludes with three helpful ways to put what was read into practice: a reflective question for parents, a related prayer, and a practical action step to follow. Parents Rising is Arlene Pellicane's newest release. This book breaks down eight strategies for raising kids who love God, respect authority and value what's right. Arlene's honest and sometimes amusing family stories give a glimpse of how to apply these strategies to everyday life. Each chapter begins with a Bible verse and a short story. From there Arlene uses her research to share some startling statistics for the breakdown of the strategies in modern day culture. She weaves other author quot Parents Rising is Arlene Pellicane's newest release. This book breaks down eight strategies for raising kids who love God, respect authority and value what's right. Arlene's honest and sometimes amusing family stories give a glimpse of how to apply these strategies to everyday life. Each chapter begins with a Bible verse and a short story. From there Arlene uses her research to share some startling statistics for the breakdown of the strategies in modern day culture. She weaves other author quotes and solid suggestions for implementing these ideas into the family. At the end of each chapter there is a question, a prayer and an action point. And interwoven in her writing she continually encourages parents to rise up. She also gives tips for single moms and blended families. There are also discussion questions at the end of the book for group meetings. Some of the topics covered are entertainment, boundaries, the role of the parent, daily Bible time and prayer, the priority of marriage, spending time with kids and getting them ready for life beyond the family home. Parents Rising is about rising up to take our place back as parents. The world has swung from a place where kids were seen and not heard (too far left) to a place where parents are seen and not heard (too far right). We are being walked on by our children and we are letting the take the lead in their lives, when they don’t know better. The How Healthy is Your Home? quiz showed me I have let things slide for too long and it’s time to rise and take control of the situation. (The quiz is not about things like how many vegetables the kids eat or if you have HEPA filters but about things like whether your children can handle screen-free days, if they show your honor and if your children are learning life skills. The eight strategies Arlene covers are as follows: Amusement is Not the Highest Priority, Parents Call the Shots, Routine and Boundaries Provide Security, The Bible and Prayer Every Day, Marriage Takes a Front Seat, Good Food Served on the Table, Love is spelled T-I-M-E and Launching Adults, Not Babying Children. Parents Rising helps parents stay (or get back in) the driver's seat of their home by reminding them of the authority and responsibility they've been given by God and providing strategies to help their children become respectful, responsible, and compassionate adults. The information in the book was familiar to me but I appreciated the reminder of the things I should be doing for and with my children and the statistics that emphasize the importance of being an active parent to my children. Some Parents Rising helps parents stay (or get back in) the driver's seat of their home by reminding them of the authority and responsibility they've been given by God and providing strategies to help their children become respectful, responsible, and compassionate adults. The information in the book was familiar to me but I appreciated the reminder of the things I should be doing for and with my children and the statistics that emphasize the importance of being an active parent to my children. Some of the information was a little convicting as I have been slack in some areas (like actively encouraging my youngest to learn how to tie his own shoes). Wow what a book! Parents need to read this message AND apply it. There are tons of parenting books out there but this one is worth your time. Each chapter of the book is about a different strategy. The 8 strategies are not hard to implement, and they are all very practical. As I read I thought that they all seem to be parenting strategies that were once popular and you saw used by many parents. Now they are rare it seems. I like that the author shares some facts but doesn't overshare facts and st Wow what a book! Parents need to read this message AND apply it. There are tons of parenting books out there but this one is worth your time. I like that the author shares some facts but doesn't overshare facts and statistics like I've found in some books. One thing that made me sad (and I read aloud to my family) is how much reading books aloud to children has decreased since the introduction of screens. We read a lot of books at our house so this made me sad to read these statistics. I recommend this book to all parents. I have a teenager and a toddler, and the information in this book is helpful to me as a parent of both of these ages. Such good practical relevant advice fills this book. Doesn’t tell parents to baby kids but exhorts parents to use their God given authority to teach kids how to behave so they can be great adults. Touches on all the topics that are affecting parenting and child raising in today’s society of “it’s all about me” instant gratification device driven world. Author is genuine and easy to read. She gives personal examples and talks about her struggles. She doesn’t give off Aires of having everything to Such good practical relevant advice fills this book. Doesn’t tell parents to baby kids but exhorts parents to use their God given authority to teach kids how to behave so they can be great adults. Touches on all the topics that are affecting parenting and child raising in today’s society of “it’s all about me” instant gratification device driven world. Author is genuine and easy to read. She gives personal examples and talks about her struggles. She doesn’t give off Aires of having everything together. She’s open about struggling with these issues too. She gives practical ways to handles these issues, lists things you can do with your kids instead of having them sit on devices, and finishes sections with questions for more personal reflection. Great book. I would highly recommend it. Arlene Pellicane shares eight practical strategies in raising kids in this godless world. Most of the strategies are things to us, the parents, to modify in order to raise children successfully. The book provides advice and real life stories from Arlene's family and what she has done, in conjunction with her husband in raise their children. The book also makes references to other books and the quotes are so perfectly balanced with her main topic. I would recommend this book to everyone that is a Arlene Pellicane shares eight practical strategies in raising kids in this godless world. Most of the strategies are things to us, the parents, to modify in order to raise children successfully. I would recommend this book to everyone that is a new parent or season parent. This book is also backed up with scriptures. At the end of each chapter, Arlene asks a question about the theme she is talking about followed by a prayer and then action plan. This book is highly recommended!!!! You are not alone. You can raise godly kids in a godless culture. I truly wish I had this book when my children were younger. Arlene lays out 8 strategies for raising kids who love God, respect authority, and value what’s right. As she walks you through these 8 strategies, Arlene comes along side of you and lets you know you aren’t alone in struggling against all the destructive forces that are arrayed against our children and raising them to become godly men and women. Practical steps are laid o You are not alone. You can raise godly kids in a godless culture. This book inspired me to reach for new heights in my parenting. Not in a guilt-inducing, condemning way, but in a tough love kind of way. Arlene speaks in a no-holds-barred manner and isn’t afraid to speak some hard truths, but she does it with the attitude of a friend who wants the best for you and your kids. I won’t lie — this wasn’t a light-hearted, feel-good read. It opened my eyes, stepped on my toes, and pierced my heart. But it was full of powerful, important truths that we all need to hea This book inspired me to reach for new heights in my parenting. Not in a guilt-inducing, condemning way, but in a tough love kind of way. Arlene speaks in a no-holds-barred manner and isn’t afraid to speak some hard truths, but she does it with the attitude of a friend who wants the best for you and your kids. Must read for Christian parents. Arlene writes as someone in the trenches with you and clearly presents eight strategies to utilize in your parenting. She presents the research behind her recommendations along with action steps. This is a practical book that will challenge you and encourage you. It truly will help you to strengthen the foundation of your family. It is a quick read but one that I'm sure that I will be coming back to again and again. I received a complimentary copy of this book fro Must read for Christian parents. Arlene writes as someone in the trenches with you and clearly presents eight strategies to utilize in your parenting. She presents the research behind her recommendations along with action steps. This is a practical book that will challenge you and encourage you. It truly will help you to strengthen the foundation of your family. It is a quick read but one that I'm sure that I will be coming back to again and again. Arlene Pellicane did again! Another hit out of the park. In a mix of personal stories and shared insights from other voices of complete knowledge and understanding, the author gives parents a roadmap. This isn’t just advice put everyday practical steps parents can take to rise to the roles they were made for. This book will definitely not on my shelf but rather will remain a nearby, handy reference for me to come back to again and again! I received an advance copy for me to review. This book has a lot of insight. The questions really got me to dig deeper into my parenting. I have more awareness of things that need to change in my parenting. Great read! Excellent. No time wasted on silly stories or barely relevant examples. Just straight to the point, tips based on what her family has found successful, and a fairly simple list of things to focus on and an action plan to get there. Great information in easy to read chapters. Provides for a lot of thought and applications! Thank you for a great tool! Highly recommend this book! 8 great strategies for Christian families!! Are you looking for some new strategies to strengthen your parenting skills? Do you feel like you are raising your child(ren) to be able to function as adults? This book is an amazing book for all parents! It provides hands on practical ways to connect with your child(ren). Arlene Pellicane encourages us to actively parent, not just watch our kids grow up. It's time to Rise Up!